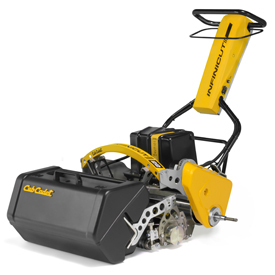 Environmentally friendly, efficient and flexible, the Cub Cadet® Infinicut® is the future of turf management. 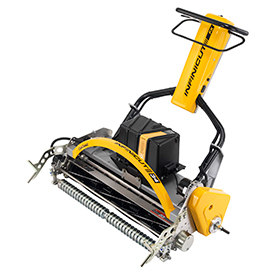 Its unique dynamic return floating head design ensures contact between the turf and bedknife remains consistent, resulting in uniform quality of cut and appearance every time, even under varying conditions. The unique design and flexible set-up allows for infinite and precise operator tuning, providing height-of-cut adjustments within .10mm increments. The all-electric lithium powered drive reduces noise and vibration for the operator without sacrificing power and vastly reduces fuel cost. All electric drive means no potential for fluid leaks. Coupled with a wide-range of TMSystem™ cassettes, the versatility of the unit extends well beyond simply cutting turf. The cassettes provide aeration, de-thatching, grooming and brushing. The patented vibration cassette accelerates a return to smooth putting surfaces following aeration. Electronic speed control ensures a constant clip rate is achieved regardless of how severe playing surface undulations are. The Infinicut’s flexible set-up, environmentally friendly power source and unmatched grooming versatility, provide a cost-effective solution to overall turf management and improved health of any playing surface.